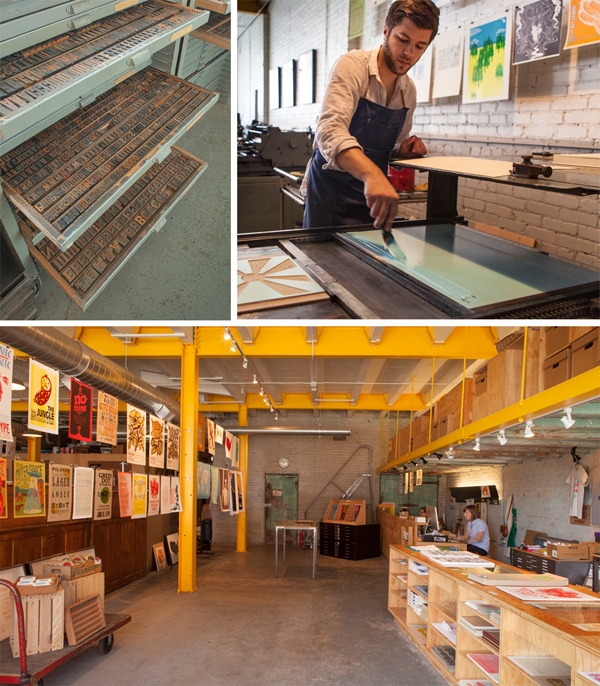 Settled near the churning Detroit River and a stone’s throw away from Joe Louis Arena and the DIA, Michigan’s own community print shop, Signal Return, thrives in the Eastern Market area. The warm, inviting shop holds an exemplary showcase of helpful staff, the milling buzz of presses running, and boasts a hypnotic clink of rollers working. Lynne Avadenka shows us around this letterpress abode to reveal a gem in the Motor City. THE PRESSES We currently have 8 working presses: a Kelsey Treadle press; a Vandercook 325G; a Triumf Proof Press; a Poco Proof Press; a Nolan Proof Press; and three C&P Tabletop presses. SIZE OF PRINT SHOP 3,000 square feet. TYPE OF SHOP We are a community shop that offers open studio hours to anyone who has taken 2 classes with us. Currently, we have over 40 people qualified to participate in our open studio. We also have a retail area where we sell prints, cards and ephemera, much of it by artists who’ve learned to print in our shop. THE LOCATION Our building is located in Detroit’s Eastern Market so on market days we have access to really fresh fruits, vegetables and local products. We are also lucky to be situated within walking distance to some great local eateries; Supinos serves up one of the best pizzas around, Russell Street Deli is a shop favorite for lunch and Germack coffee keeps us awake during those long days in the shop. Our shop is an important part of the expansion of vitality in this historic area. FAVORITE THING ABOUT THE SHOP Our prized possession is our collection of type. Although we had a pretty good base to start with, earlier this year we got a very large, generous donation of type in excellent condition. 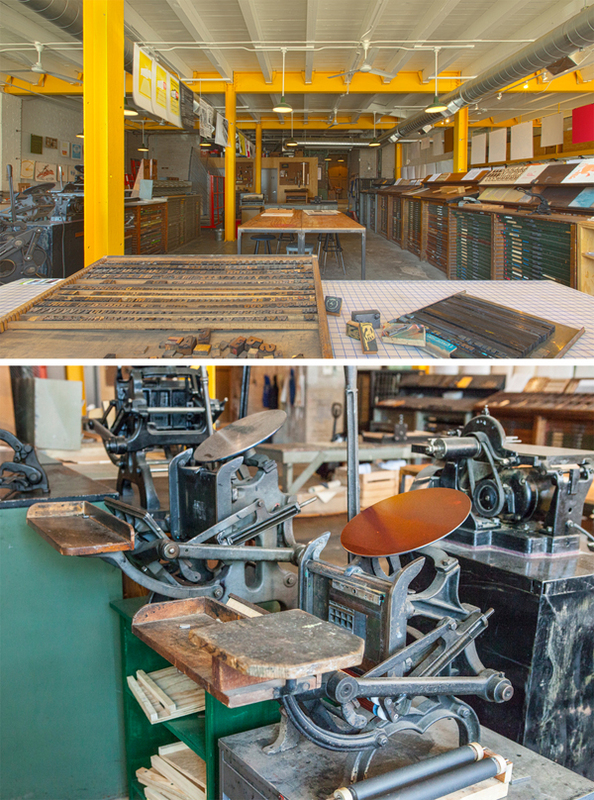 This included 2 full cabinets of wood type and 8 cabinets of metal type. We couldn’t think of anything for this one…I think it’s different for everyone who uses the shop. FAVORITE INK We hand mix Von Son oil-based ink and provide use of it to all of our open studio members. If I had to say a favorite color, I would say what we see most coming out of the shop is red. People love to make red letterpress prints! SOLVENT OF CHOICE We use odorless mineral spirits—the wetter the rag, the faster the clean up! PLATE AND BASE OF CHOICE We’ve been open for two years, focusing on hand set wood and metal type. A Boxcar base is at the top of our wish list! FLOOR PLAN TIPS Rubber mats on the floor, in front of presses, help legs and backs during long days of printing. PIED TYPE No, none yet. ORGANIZATION ADVICE Volunteers! It’s hard to keep on top of everyone who comes in for group workshops so when things start to get crazy around the shop, we pick up a few pizzas and have some lovely people come in and help us sort type and spacing material. PRINTING ADVICE Everything always takes longer than you think. This entry was posted in Shop Talk, Work Spaces by Rebecca Miller. Bookmark the permalink.